The MMRT drone team at McIntosh High School celebrate successfully defending their national championship title at the UAS4STEM National Championship. (L-R) Sam Triplett, Luke Wonderley, Robert Palla, Matthew Harmon, Noah Statton, Adrien Richez, and Logan Connerart. Photo/Submitted. Mission accomplished, the McIntosh High School’s drone team successfully defended their national drone championship title by clinching the National UAS4STEM championship for the second consecutive year. Above, the MMRT drone team at McIntosh High School celebrate successfully defending their national championship title at the UAS4STEM National Championship. (L-R) Sam Triplett, Luke Wonderley, Robert Palla, Matthew Harmon, Noah Statton, Adrien Richez, and Logan Connerart. Photo/Submitted. 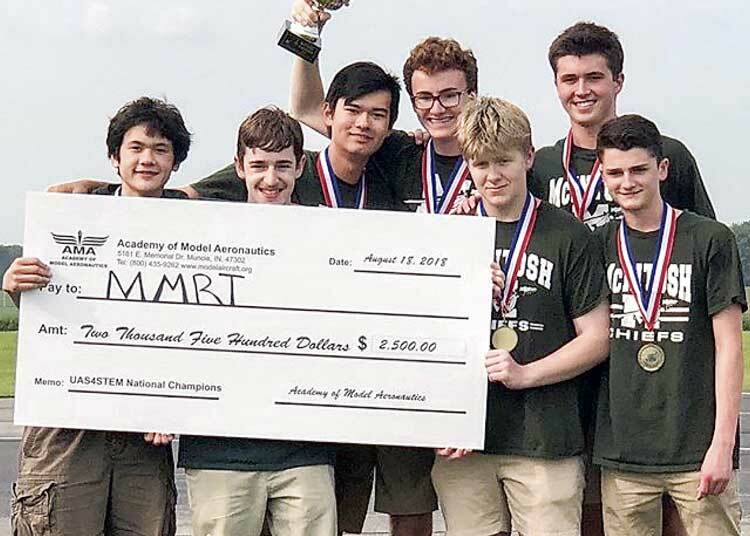 The McIntosh Multi-rotor Team (Team MMRT) was one of 10 teams across the nation participating in the event, sponsored by the Academy of Model Aeronautics. Team members are Sam Triplett, Luke Wonderley, Robert Palla, Matthew Harmon, Noah Statton, Adrien Richez, and Logan Connerat. As the first place winners, the team received a $2,500 cash prize. The competition was held at the International Aeromodeling Center in Muncie, Indiana on August 18.The team qualified for the national competition after winning their regional competition earlier this year. Regional competitions were held at locations throughout the nation with only 10 teams advancing to the national championship. UAS4STEM is a team-orientated, competitive program for middle and high school students. Students work together building their own drone, learning about aviation, and practicing STEM (Science, Technology, Engineering, Math) related skills. Each competition has a mission. This year teams were challenged to complete a waypoint and payload delivery mission using a small drone. In addition to building the drone, teams were also tasked with the design and build of a delivery mechanism that could support the designated payload. Drones had to comply with special instructions for departure and arrival procedures, and then remain within the assigned airspace. Teacher Seth Bishop is the sponsor of the McIntosh High School drone team.